The global success of The Martian and its subsequent film adaptation, catapulted Andy Weir into the public eye. Whatever he chose to write next was always going to draw attention. Set in our near future, Artemis is the story of Jazz Bashara, a young girl living on the moon. Struggling to make a life for herself, Jazz becomes embroiled in a criminal sabotage operation, placing herself, her friends and the whole colony in peril. Her experiences teach her more than she might ever want to know about how the Luna colony really operates. Can she save everyone in time? Artemis might be set in the same fictional universe as The Martian, but there’s no discernible connection made in the narrative. If it is, with no mention of a moonbase in the previous book, the suggestion would be that it is set a ways in the future. The experience of writing, submitted and editing The Martian has clearly helped Weir develop his style. Artemis is clearly his book, a work written in the same casual and confident first-person journal method as before. There’s an immediate marketing pull for this work. First, we went to Mars, now we’re going to the moon – fine – that works. However, Artemis does not have the same kind of immediacy as Weir’s previous work. There isn’t a sense of capturing the moment that we had from before. The young age (and demeanour) of the protagonist does suggest this could be a Young Adult novel, and there isn’t much content to contradict this assertion, other than the swearing. Weir’s prose is uncomplex, open and accessible, so this would be a good choice, in terms of categorising. However, if this book is considered as YA, then the readership Weir is speaking to, immediately narrows. Artemis doesn’t have the same industrial quality to it either, in that we aren’t engaging with the dreams and imaginations of the science community in the same way, but we are still making use of the same technical explanations of how everything on the colony works. This is where Artemis shares a weakness with The Martian in that Weir is far more comfortable handling the technology than he is describing emotions, vistas and action. Without the same sense of tension and identification as its predecessor, Artemis suffers with this content in a more obvious way. Artemis does try to engage other audiences. Jazz’s background as a sweary lapsed Muslim is complex, and Weir sketches out a set of interesting details around this and around the involvement of Kenya as an authority over the Luna Colony. The diversity of characters is a strength of the work in that the colony comes across as being diverse and inclusive. However, some of the character complexities in our protagonist bring with them a set of identification issues. Millions of people want to be astronauts, but millions of people don’t want to be desperate thieves wondering where their next paycheck is coming from. This means Weir’s writing has to work a bit harder to connect us with his main character, particularly when she is used as an unreliable narrator. At times, Jazz’s fiery independent spirit gets in the way at times and doesn’t endear her to the reader. The plot of Artemis also has problems. Weir sets up the initial ‘heist’ in a straightforward way, much like an Ocean’s Eleven movie and does what most writers do, throwing in a set of unforeseen problems. There’s a bit of Harrison’s Stainless Steel Rat to this, but without the panache. Unfortunately, the problems thrown in ultimately result in Jazz being responsible for a near colony ending catastrophe. The payoff of her involvement in this is not properly realised in the book’s conclusion, with characters a little too keen to forgive and move on. 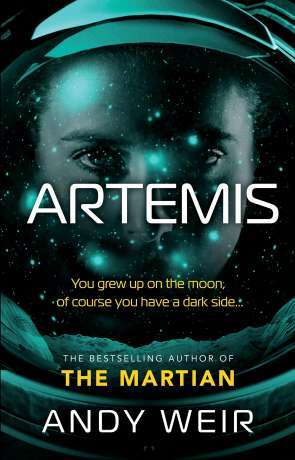 Artemis is a solid second book from Andy Weir that showcases his undoubted ability. It will be interesting to see what he elects to explore with his third book. Written on 17th January 2018 by Allen Stroud.